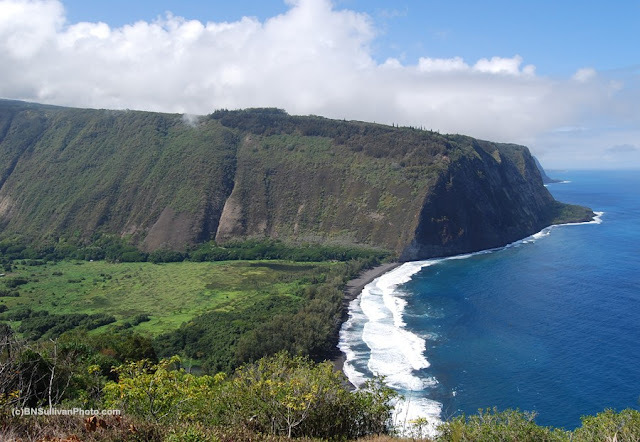 This is the Waipi'o Valley, situated on the northeastern coast of Hawaii's Big Island in an area known as the Hamakua Coast. It is one of those end of the road locations, not on the way to or from anywhere else, and is sparsely populated. Most of the people who live there are taro farmers. The valley extends inland about six miles from the coast, and is completely covered with lush tropical vegetation. At the ocean edge, the valley is fringed with about a mile of black sand beach. Steep cliffs completely surround the valley, and in some places rise nearly 2,000 feet above the valley floor. Waipi'o Valley is a popular tourist destination. Visitors can tour the valley on horseback, or by riding a mule-drawn wagon to see the many waterfalls cascading down the sides of the cliffs. I took this photo last week from a lookout near the top of the treacherous road that leads to the floor of the valley. The road is steep -- a 25% grade -- so only four-wheel-drive vehicles are allowed on it. It takes about a half hour to drive slowly from the lookout to the valley below. You can also hike down the road if you are fit. I have no idea how long that takes! To see more MyWorld images click here, or click the MyWorld button at the top of this post. Beautiful picture! And I love the view it was taken from. I bet the waterfalls and cliffs are amazing to see in person! With a 25% grade, I'm not surprised only 4-wheel vehicles are allowed on the road. Bobbie: What a very rich looking valley. So, this is a place to go see waterfalls. :-) I've only been to Hawaii once and was on Oahu. One of the things I loved was how thick and lush the vegetation was. I can't wait to go back one day for a longer visit. I have to keep this place in mind. I wish I'm there...my dream place. Posted mine, HERE. Have a great day! And nice to view your world today! Interesting post and great photo. It itches me to go on holidays when I see such beautiful landscapes ! I love your photos. Makes me want to visit your state some day. Stunning photo. What a great view and place to live. Thanks for sharing. Excellent post and your photos are awesome! Man you have a decided advantage over a lot of us in the My World realm. Is it even possible to take a bad photo in your world? I'm not sure it is. Nevertheless, you do get some exceptional shots. And this one ... is definitely among them. The only time I ever got to Hawaii was when I was 12, and we might not have made it then if my grandfather hadn't been stationed at Schofield at the time. But with budget constraints and so forth that a kid that age could never understand we never made it to any of the other islands and spent the entire trip "only" on Oahu. That's still a pretty exciting deal for a kid, so it was impossible to be disappointed. Fantastic photo from your world. And I say it again. Your place is heaven on earth! What a breathtaking sight! Excellent. Thanks to everyone for visiting MyWorld. I'm trying to think of the place from where you got this wonderful view! It's a side of Hawaii I never have seen on photos! A very beautiful part of your world. Thank you for your heartwarming words! Such a beautiful place and interesting post. Great view. Beautiful your World. We live in a big "little" World as you said,indeed. Thank you for sharing your part of the world with us. Those cliffs are certainly dramatic, and all the colors in this photo are stark against one another, yet somehow also blend with one another. Mother Nature knows what she is doing. Hawaii is so beautiful ! Many locations for landscape photography ! I would love to go there & take many photos ! Thank you all for visiting. I enjoyed reading your comments. Your photos are beautiful...I'll be back to visit! !